Now back at William & Mary as the executive director of the Alumni Association and associate vice president for alumni engagement in the College’s new Office of University Advancement, Midyette has more than fulfilled her childhood prophecy. During her time at the College, Midyette participated in the choir, was a freshman cheerleader, an RA and a member of Delta Delta Delta. While she found the academic courses demanding, Midyette felt the education she received at William & Mary was a differentiator in her life. But her time at William & Mary wasn’t all work. Midyette’s best friends in life are those that she met at the College, including her husband, Payne Midyette ’75. The couple has two boys. Payne IV, a graduate of Vanderbilt, is starting a master’s program at Georgia Tech. Reade is a senior at the Air Force Academy and wants to fly helicopters for special operations. 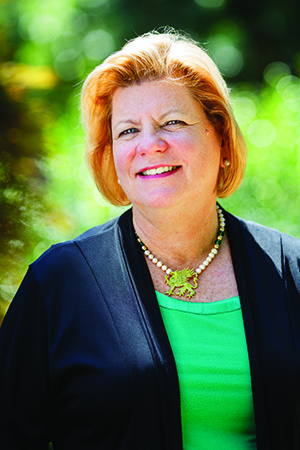 After graduating from William & Mary, Midyette went into banking and finance, followed by a career in technology and telecommunications. Before coming to the Alumni Association, Midyette served as CEO of the Girl Scouts of Greater Atlanta. Throughout her busy career, Midyette has not forgotten her commitment to the College, serving on the boards of the Alumni Association and Annual Giving. In 2011, she was awarded the Alumni Medallion. The goal of the merger is to maximize resources and to improve the ways in which the College engages and serves William & Mary’s alumni. The University Advancement model allows for enhanced coordination across university departments, which strengthens the College’s ability to be more strategic, thoughtful and effective in its interactions with alumni and friends. The new model will enhance the potential for alumni involvement in W&M admission, job placement and mentoring, and it will expand career services and engagement opportunities for alumni. “As a community we know the power of unity, the power of collaboration, and that the only path forward is together. In order for William & Mary to sustain itself and continue to deliver that quality experience, it requires all of us. That’s what alumni engagement is all about,” Midyette said. In her previous position with the Girl Scouts, Midyette helped lead the organization through a rebranding initiative. This effort is analogous to her new role at the College.